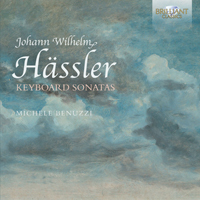 Description: Here is a companion to Brilliant’s 2012 Hässler release (03N037) and to the Oehms Classics modern piano recording from last May (05E027). As we described him before: “Dramatic, theatrical, melancholy, delicate, sometimes bizarre, questing, experimental, genre-bending, a bridge between the Bach family tradition and the Romantic period. If he hadn’t spent the last 28 years of his career in Russia, he might not be so forgotten now.” 4 CDs. Michele Benuzzi (clavichord, harpsichord, Silbermann fortepiano, Broadwood square piano).